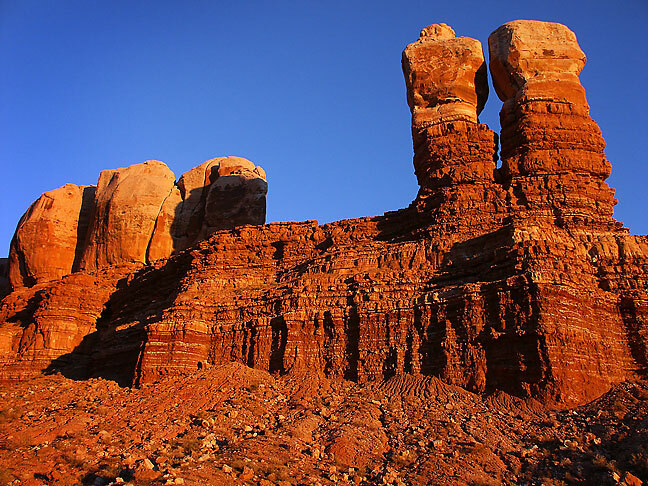 I made this image of the Navajo Twin Rocks in Bluff, Utah, in November 2002, just my second trip with the Minolta DiMage 7i. As a professional photographer, I have access to a lot of cameras. I use at least five different cameras in a typical work week, most of which are digital SLRs. One of my Minolta DiMage 7i cameras sits on a tripod recently. My first digital SLR at work was the Nikon D1H, which my company bought for me in August of 2001, an excellent camera for newspaper shooting. It has been retired since 2009, but I made a lot of amazing photos with it, photos that hold up remarkably well consider the technical limitations of the day. The two-inch LCD monitor on the back of the Minolta DiMage 7i seems small by today’s standards, but I had no problem working with it even in bright light. 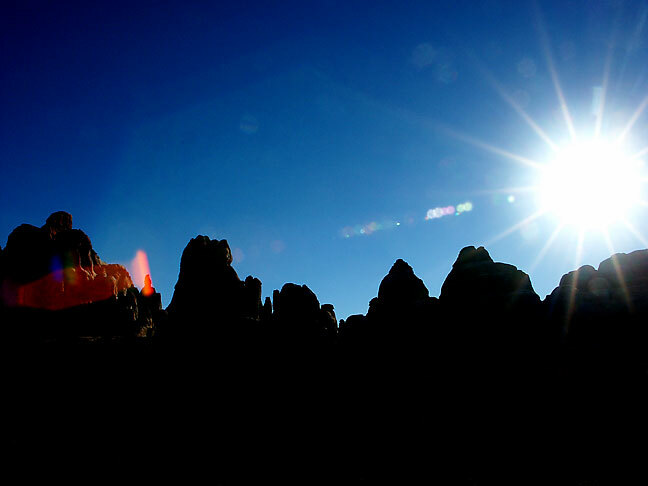 With seven straight aperture blades, the 7-51mm lens in the DiMage 7i makes gorgeous 14-point sunstars. It was around that same time that I decided I wanted digital capability for my own purposes, yet something smaller, lighter, and more versatile, for situations like hiking and traveling. In the summer of 2002, I bought a tiny point-and-shoot, the Nikon CoolPix 885. It was small enough to pocket, but wasn’t as capable as I would have liked for “fine art” type images. After some more research, I bought a Minolta DiMage 7i in the fall of 2002, and used it first on my two hiking trips that autumn, Caprock Canyons in October, and Sand Animals in November. 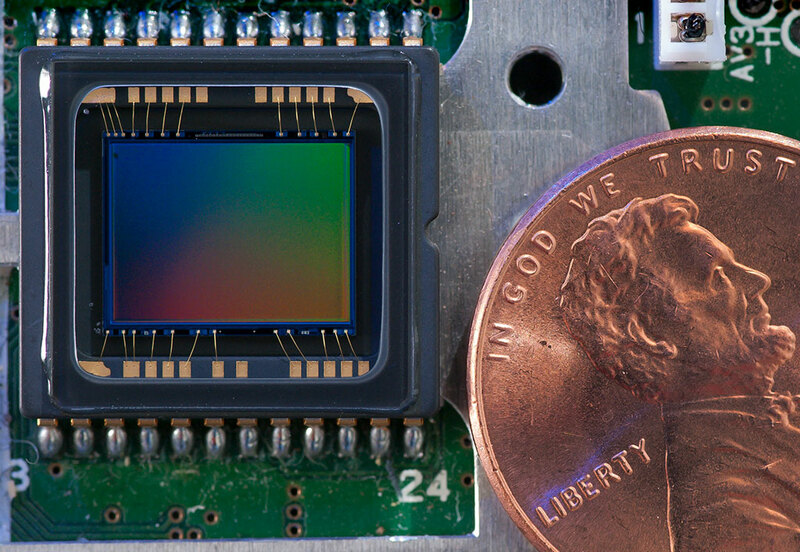 Photographed next to a penny reveals the real proportion of the Minolta’s 8.8 x 6.6 mm CCD image sensor. 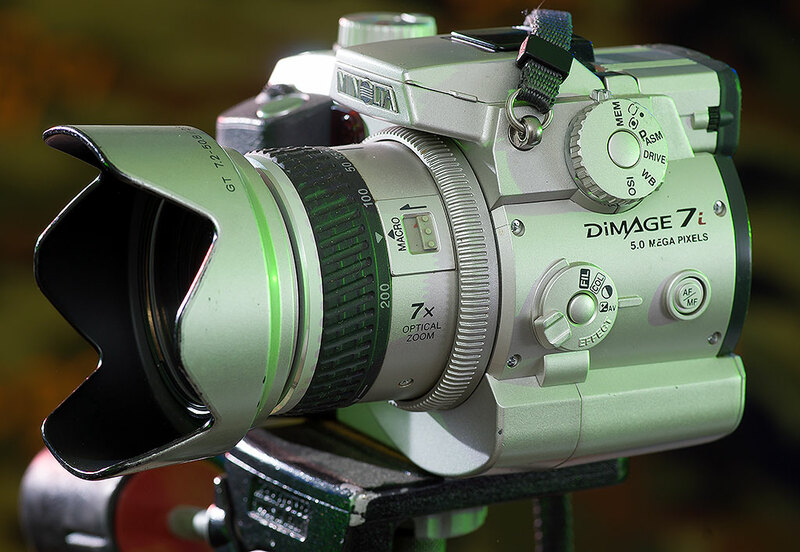 The DiMage 7i poses with its more expensive, supposedly superior contemporary, the Sony F828. Right away I was very pleased with the camera, particularly the color I got right out of the box, and the quality of the excellent 7.2-50.8mm f/2.8-3.5 lens. The sensor responded well to the use of a polarizer, though you had to trick the exposure system by locking it before you rotated the filter to the desire position. In one of life’s crueler tricks, the DiMage 7i turned out to be a much better camera in most respects than the more expensive, higher-pixel-count Sony F828. 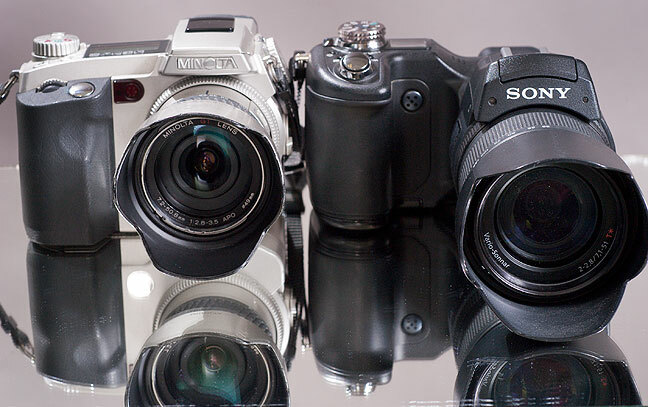 I have one of each now, and have never liked what I get out of the Sony. 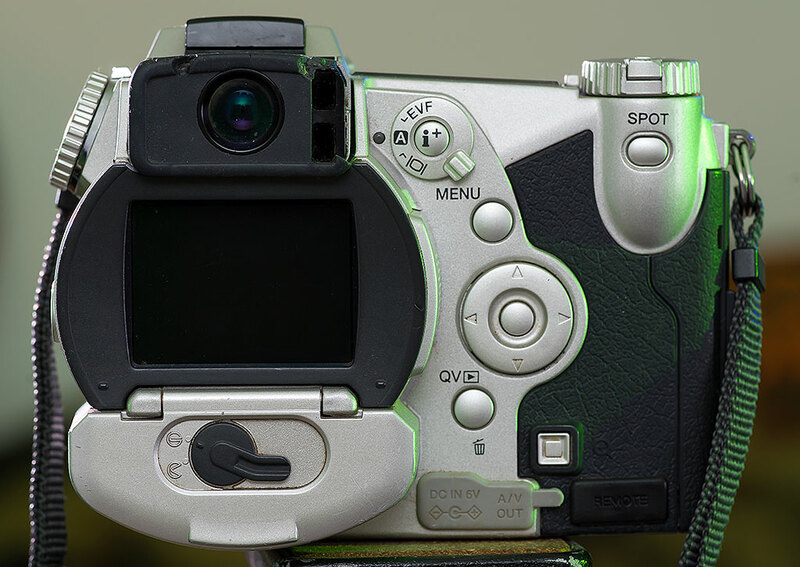 The biggest flaw for the Sony was dreadful purple fringing, which never plagued the Minolta. 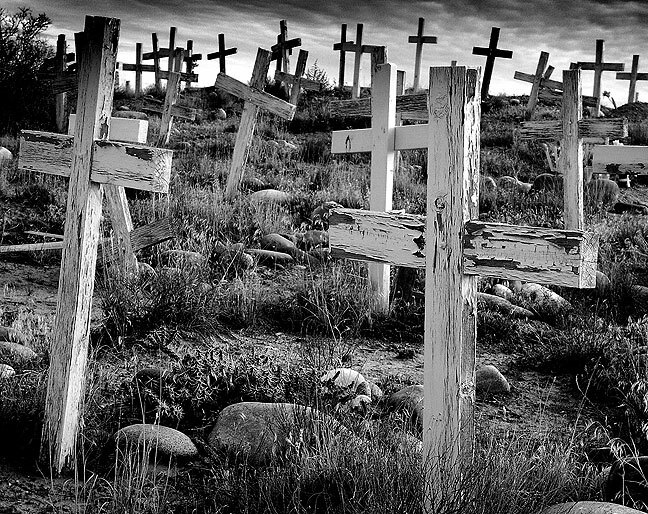 Possibly the finest image I made in the desert in my early years of exploration, this image of a mission graveyard was made south of Farmington, New Mexico with the Minolta’s black-and-white mode selected. It was during the heart of my DiMage 7i use that I met Abby, who would become my wife. I made this image of her on our first vacation together, The High Road, in July 2003. Over the years I bought and shot with cameras that were obvious replacements for the DiMage, but it always remained dear to my heart, particularly for long hikes when I needed a light load. Eventually the 7i died, and I took it apart. Some years later, I thought I’d see what the 7i was fetching on Ebay, and when I saw them going for less than 10% of the original price I paid, I bought another one for occasions when I wanted a very small, light camera. The Minolta DiMage 7i is good-looking and feels good in my hands. 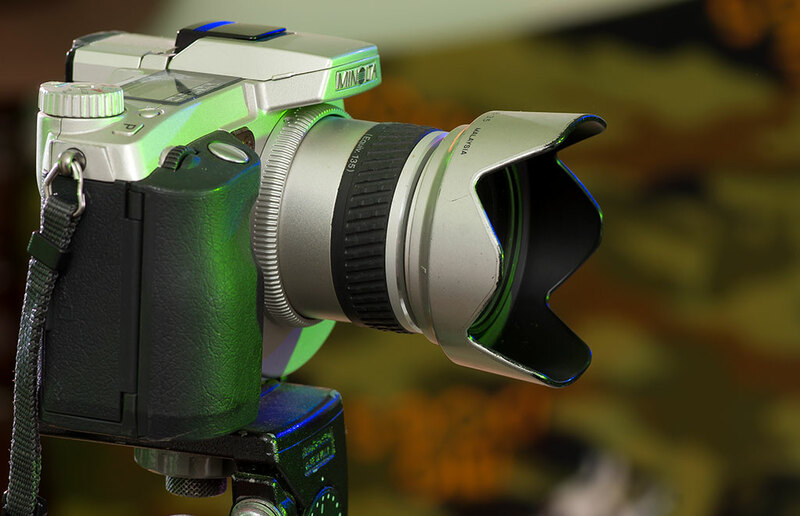 It’s also a good-looking camera, in a Buck Rogers sort of way.